Happy Valentine’s Day to all my adorable little Furbabies! 7 years on……miss you still, I always will. My beloved Yoshi boy. Yappy new year! Hope it’s healthy and happy for us all. Merry Christmas to all my customers…..canine and hooman, old and new! Wagg-On is 5 years old today!!!!! Yappy Woofday to us! I cannot believe so much time has passed since Wagg-On was born. I continue to love what I do as much today as then…….and I consider myself very lucky to have so many lovely clients. I really do feel blessed. Here’s to Wagg-On ……. which wouldn’t be here without you …… and I never take that for granted! I came across this recently and it really touched me…….such a lovely way of thinking about our canine friends who are with us for way too short a time……..it’s a lengthy piece, but I think it is well worth a read….. Being a Vet, I had been called to examine a 10 yo Irish Wolfhound named Belker. The dog’s owners and their little boy were very attached to Belker and they were hoping for a miracle. After examining Belker, I found he was dying of cancer and I told the family we couldn’t do anything for him. I offered to perform the euthanasia procedure for the old dog in their home. As we made arrangements, Belker’s Mum and Dad thought it would be good for their 6 yo son to observe the procedure, thinking he might learn something from the experience. The next day, I felt the familiar catch in my throat as Belker’s family surrounded him. The little boy seemed so calm, petting the old dog for the last time, that I wondered if he understood what was going on. Within a few minutes, Belker slipped away peacefully. The little boy seemed to accept Belker’s transition without any difficulty or confusion. We sat together for a while after Belker’s death, wondering aloud about the sad fact that dogs’ lives are shorter than human lives. The little boy, who had been listening quietly, piped up “I know why”. We all turned to him. What came out of his mouth next stunned me. I’d never heard a more comforting explanation. It has changed the way I try to live. He said “People are born so that they can learn how to live a good life – like loving everybody all the time and being nice, right?” The 6 year old continued…..”Well, dogs already know how to do that, so they don’t have to stay for as long as we do”. Remembering my beautiful bullmastiff boy who crossed The Bridge on this date, 2012. Yoshi, you are always in my heart. Whit a week! Mother Nature 3, Wagg-On – 0! Service severely curtailed this week thanks to the snow. It’s too much of a risk to take the Wagg-On out when the white stuff is about. Thank you to all my lovely, loyal customers for their understanding, flexibility, consideration and patience during this period of adverse weather. Roll on spring! …….and today! Enough already…..I have work to do! Snow? No go! Wagg-On is snowbound today…….roll on spring! Yappy New Year everyone! I hope it is a healthy, happy and peaceful one for us all. See you all soon! Merry Christmas to all my lovely customers (both canine and human!). Thank you for the many cards, gifts and festive wishes I have received…..quite overwhelmed and very appreciative of your kindness and generosity. It’s been another fantastic year here at Wagg-On and I would like to thank you all for your continued custom and support. See you next year! ster egg collection out of reach of the furries. Remember, chocolate is toxic to dogs. TICK tock……the clocks spring forward ……. and the ticks come out to play. Just a wee reminder to check your pet regularly and take vet advice on flea/tick prevention. Yep, it’s that time of year again! Such a sad tale, this little dog’s death will not be in vain if we can all learn from it. It almost felt like spring today! Yappy Valentine’s day to all my lovely little canines! My Yoshi, somewhere over the rainbow. Five years on and still sorely missed. Merry Christmas to all my lovely customers. Thank you all for your custom – we wouldn’t be here without you and I know it – and for the generosity and kindness so many of you have shown me this Festive Season. Wishing you a very happy, healthy and prosperous 2017. Look forward to seeing you all next year! I am so very sorry to hear that 4 of my lovely canine customers have recently crossed Rainbow Bridge – Heidi, Ralfie, Tammi and Kala. My heartfelt thoughts are with each of their lovely families who, I know, will be heartbroken by each of their losses. It’s a very tough time, as anyone who has lost a beloved pet will know. Thinking of you all. We’re 3 years old today! Happy Birthday to Wagg-On! I can hardly believe that 3 years have passed since Wagg-On was born. It has gone from strength to strength with over 300 customers on the books! Thank you to all my lovely clients, old and new. Wagg-On wouldn’t be here without you and I know it! Just a wee word of warning: over the past 2 days I have heard of dogs who have been bitten by Adders – one in the Bearsden & Milngavie area and one in Stepps. Sadly, one of these dogs had to be put to sleep as a result of the bite. Adders like to bask in the sun and the warm weather is encouraging them out of their lairs. They also like wooded areas and long grass and will only strike when they feel threatened……. so during this warm weather, it may be an idea to keep your dog on the lead if you can’t see clearly what is lurking in the grass……. Tick, tock, tick, tock……yep, that time again……..have a chat with your Vet and make sure your dog’s tick/flea prevention treatment is up to date. Quick reminder! All dogs must, by law, be microchipped by 6 April……..
From the 6 April 2016, it will be compulsory for all dogs to be microchipped and their owners’ details registered and kept up to date in a database complying with certain conditions. This will help reunite lost dogs with their owners. Failure to comply could result in fines of up to £500. GLASGOW: Glasgow Rehoming Centre, 351 Hamilton Road, Uddingston, G71 7SL Contact them on 0141 773 5130 to make an appointment. PERTH: North Inch Park, Perth @ North Inch Park, Perth PH1 5HS on March 2 @ 10:00 am – 2:00 pm. No appointment necessary, just turn up on the day. Your local Vet may also be able to offer this service for a fee. Have I ever told you just how much I love my job? Baby Spaniel Smooches, Terrier Tickles, Yodelling Yorkies, Sheltie Stars, Cockerpoo Cuddles, GSD Gorgeousness, Bashful Bichons, Lhasa Love, Bulldog Buddies, Boxer Bubbles, Newfie Nuzzles, Westie Warmth, Shih Tzu Snuffles, Schnauzer Snuggles, Labrador Lollops, Retriever Romps, Poodle Poshness, Leonberger Leanings, Collie Crushes, Maltese Madness, Doodle Daftness, Rottie Romance……oh, the list is endless! 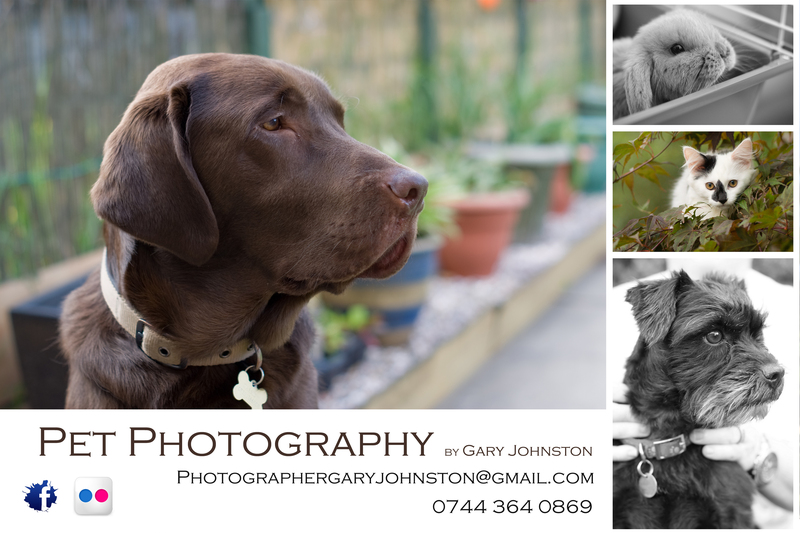 I’m very lucky to have such lovely customers and very privileged to be allowed to share in their furry friends’ lives. Thank you everyone! 4 years on, I still miss my Yoshi boy. Your paw prints are forever in my heart. Baby, it’s cold outside…….check out this handy infosheet to help keep pooches safe in colder temperatures. And so another busy grooming year draws to a close. Now in my second year, 2015 has been a fabulous one for Wagg-On Dog Grooming. I would like to take this opportunity to thank you for allowing me the privilege of grooming your precious pooches. Wagg-On would not be here without you, and I know it. Big and small, I’ve groomed ‘em all! There have been some sad moments too and I would like to raise a toast to those beloved dogs who crossed Rainbow Bridge this year. You will never be forgotten. I am quite overwhelmed by the kindness and generosity shown to me and would like to say a big thank you for the gifts of wine, chocolates and (as yet, unwrapped!) parcels I have received from my little canine friends. So…..THANK YOU! I also received lots of tips and have chosen to donate some of this money to Clyde’s Cash for Kids Christmas Appeal, so thank you again, everyone, for your generosity. Wagg-On is now closed for the holidays and will be back on the road on 4 January. Have a very Merry Christmas and all the very best for 2016…….now, where’s that corkscrew? Lots of good advice around on making sure our pets are safe at Christmas……. First day of advent tomorrow……please remember and keep those chocolate calendars out of reach of wet noses and waggy tails! 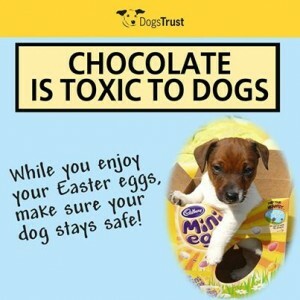 Remember, chocolate is poisonous to our pooches…. Soon be time for fireworks……and that’s a scary prospect for many of our furry friends. Check out this advice from RSPCA on how to reduce the impact of fireworks on our pets. A new page has been added to Wagg-On’s website in memory of all the beautiful dogs I have groomed and who have now crossed Rainbow Bridge. I feel a sadness whenever I get the news that one of my lovely canine customers has died, and an empathy for the owners who have lost a treasured family pet. May memories and paw prints live in your hearts forever. We’re 2 today! Let’s Pawty! Thank you, everyone, for your continued support of Wagg-On. We have gone from strength to strength in the 2 years we have been running and it’s all thanks to you and your lovely canines! Big and small, I’ve groomed them all and I thank my lucky stars every day for the privilege! Paws up for Wagg-On! Well, just back from a fortnight in Sicily. Meet the biggest Great Dane I’ve ever seen over there…..why, he understood Italian perfectly! Thankfully, his owner took him into consideration and walked him after the sun had gone down and the pavements were a little cooler….. Dogs die in hot cars! Please do not leave your dog in the car on a warm/sunny day. Even if you plan on being away only a short time. The consequences could be fatal. The temperature inside a car can rise very quickly, your dog can overheat with fatal results. Wagg-On is fully ventilated and has a cooling fan so there are no worries there. When outside on a hot, sunny day you must make sure you look out for signs of overheating, dehydration and even sunburn. Make sure your pooch can rest in a cool area and has access to plenty of fresh water. If s/he exhibits any of the following signs, veterinary assistance should be sought immediately. Where has time gone? It’s summer today (might not be tomorrow though!) and so I thought it was time to issue a wee reminder about stings…..what to do if your pooch investigate small, buzzy creatures and ends up with a nasty sting! First, avoid temptation to remove bee stings with tweezers because this can force more venom into your pooch. Instead, swipe down with a credit card or similar to force the sting out. Wasps don’t tend to leave their stings behind, which means they can sting more than once. Next, apply a paste of baking soda and water for bee stings to the affected area – this will help to reduce the pain. An ice pack (wrapped in a towel) will also help. For wasp stings, apply lemon juice to the affected area. Make sure you look out for reactions – some pooches will be allergic to the stings of a bee/wasp and it can be fatal. Signs to look for are general weakness, difficulty breathing or lethargy. Call your Vet immediately if any such symptoms occur and get to the Vet straight away. Finally, prevention is always better than cure. Keep your dog away from flowers where bees like to collect pollen/nectar, from wasps’ nests/bees’ hives. Check water dishes too…..drowned bees/wasps can still have a sting which will cause problems for your pooch if ingested. TICK, TOCK……..yes it’s that TIME again – I have removed 2 ticks this week. Please check your dog regularly for ticks – they look like little warts on your dog’s skin…..they can be reddish brown (deer ticks) or greyish (sheep ticks) in colour and are nasty little blighters. Care should be taken when removing them – make sure you don’t leave the head embedded in your dog. You can buy specialist tick removing tools from your Vet. Wagg-On Dog Grooming is busier than ever! We get lots of calls, texts and Facebook messages on a daily basis which is fantastic and we are delighted that our service is so popular. In fact, we are booking 6 – 8 weeks ahead at the moment. When you call, you are likely to be connected to our voicemail service and that’s because we never answer calls while we are grooming dogs. To do so would break the concentration of both groomer and dog which could cause a health and safety issue. We also don’t want to prolong the time a pooch is on the table by answering calls during the groom. Because we like to spend time getting a good understanding of our clients’ requirements and their dogs’ needs, each call back can take 5 or 10 minutes. When we are not grooming, we are driving to our next appointment. And when we arrive home at night, we have cleaning and admin duties to perform too……and that’s all before we have our tea! We will always get back to you within 24 hours of you contacting us - whether you get in touch by phone, text or Facebook message. You can help us be as efficient in doing so by leaving your contact details, as well as the breed of dog you would like groomed and the area in which you live. Look forward to hearing from you! Yoshi, gone but never forgotten. Still miss my beautiful big boy. Well! First big snow of the season……and it has caused havoc! Not able to reach appointments in Dunning and Dunblane today because of road conditions. After bad snow experience last month and a rather nasty and potentially very dangerous skid at Gleneagles today, Wagg-On now has a “Snow? No Go” Policy…..better safe than sorry. I will always keep in touch with my customers to let them know what’s happening and reschedule appointments if necessary. Better to be safe than sorry…..
What a scary time I had today…..heading up the big hill to Carrickstone and snow comes on. Snowplough appears as if by magic and I followed it up the hill…..then he left me! Very shortly after and I was stuck – couldn’t get up the hill. Not much fun in a 2.5 tonne truck! Had to reschedule all appointments for the day – thanks to all my lovely customers for being so accommodating. 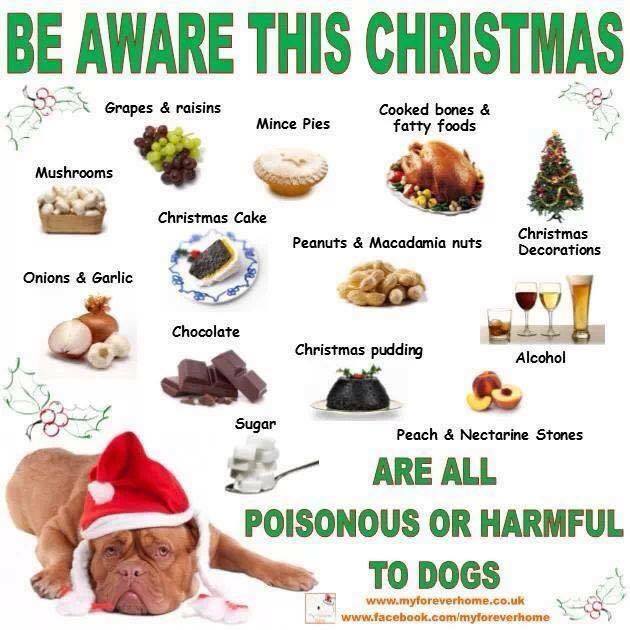 Nothing we can do about Mother Nature I guess…..
Christmas is just around the corner……here are a few wee reminders to help us make sure we keep our pooches safe as we prepare for the big day! Fairy lights: make sure you cover any trailing wires to make sure your pets aren’t tempted to …investigate and bite through the cable.Decorations: make sure they are well out of paws’ reach – swallowing a wee bauble or even stepping on a glass one can cause your pet a nasty injury and unnecessary pain and suffering.Plants: did you know that holly, poinsettia and mistletoe are poisonous to our pets? Best keep them out of the way of wet noses and waggy tails.Toys: keep an eye on what your pet does with his Christmas gifts from Santa Paws…..squeakers, bones, etc…….be vigiliant.Visitors: be aware that the excitement of guests and present opening can cause your pet to behave differently. Allow them to retreat to a quiet place and chill – better safe than sorry.Treats: lots of our festive fayre is poisonous to pets….check out this infographic for more details…..
First day of advent today! Make sure those chocolate advent calendars are out of reach of wet noses and waggy tails…..as you know, chocolate is toxic to dogs. Remember, remember, the 5th of November. Here is some excellent advice ahead of tomorrow’s fireworks, courtesy of Vets Now….. Fancy having your pooch photographed? Photographer Gary Johnston does a pawtastic job of capturing pets on film. Mine is the one in the top right corner! Yappy Woofday to us, Yappy Woofday to us, Yappy Woofday to Wagg-On, Yappy Woofday to us! Yes, we are 1 year old today! Hip hip hooray! You can read all about our first year in the Newsletter opposite. Attended another pawtastic Seminar on Canine Behaviour. What a fabulous insight into the communication patterns of our pooches. You will already know when your dog needs out, wants dinner, NEEDS you to go and fetch your boots and jacket and take him for a walk RIGHT NOW……! This Seminar discusses the importance of our canine friends’ communication methods on the grooming table and helps us Groomers to ensure that stress levels are managed appropriately. Really interesting stuff! Just back from a fabulous 2 weeks in Greece where it was HOT, HOT, HOT! We met lots of dogs, some big, some small, some hairy…..some very, very hairy! Do you know that not one of them was ‘shaved off’. They knew how to keep themselves cool……lots of shade, the occasional paddle or wallow in little pools provided just for them, consumption of lots of fresh drinking water and because their coats where brushed out, their natural ability to keep themselves cool kicked in……even on the very, very hairy dogs! Wow! We are getting more and more popular by the day! Wagg-On Dog Grooming is now fully booked until the middle of August!!!! Thank you to all our customers, old and new, for their support. We wouldn’t be here without you! A lady called Rose Innes from the Cumbernauld area left me a voicemail last week with a mobile telephone number which was not connecting. I tried several times to contact Rose via the number she provided using different phones……I even texted a message to the number she left but could not get in touch with her. Rose tried again to reach me today – left me the same number and the same thing happened. I put an appeal on Wagg-On’s Facebook page thinking that I may be able to reach her through that medium, to no avail. Customer service is very important to me and I hate the idea that someone out there thinks I have not bothered to return their calls. There is nothing I can do – if someone leaves me a wrong number (call log displayed ‘Private Number’), then I have no way of getting in touch. I just wanted to post this to emphasise the importance of checking and leaving a correct contact number and on the off chance that Rose may visit this Blog page. Myth #1: Shaving my dog in summer will keep him cool. Fact #1: No it won’t. If your dog has a double coat, the undercoat will insulate him against the cold in winter and keep him cool in summer. Shaving him will remove his natural ability to keep himself cool in warmer weather. Unlike us humans, he does not cool himself through his skin. Instead, he pants to cool down. So, when you see him panting, he’s doing it because he is cooling himself down. He will also sweat through his paw pads. Shaving his coat will also remove his natural protection against the sun’s harmful rays and his protection against bug bites. Myth #2: Shaving my dog will reduce shedding. Fact #2: No it won’t. Dogs with undercoats shed. End of story. Shaving a dog will not prevent this, although the hairs will be shorter when shed. A good, regular grooming protocol will help reduce shedding because you are removing the shed-able coat. Myth #3: It’s okay to shave my dog. The hair will grow back. Fact #3: Not necessarily. It may grow back eventually, but it will never be the same. Your pooch could end up with a coat which will never shine, always look patchy/scruffy and which offers no protection from the sun or bug bites. TICK, TICK, TICK, TICK……..yes it’s that TIME again when ticks and other pests are out to bother our pooches. Please check your dog regularly for ticks – they look like little warts on your dog’s skin…..they can be reddish brown (deer ticks) or greyish (sheep ticks) in colour and are nasty little blighters. Care should be taken when removing them – make sure you don’t leave the head embedded in your dog. You can buy specialist tick removing tools from your Vet. Bees and wasps are also out in force now. If your dog gets stung by a bee, it will leave its sting on your dog. Using a credit card or similar, swipe the sting off in a swift downward diagonal motion and bathe the area with a solution of Bicarbonate of Soda. In the case of wasp sting, there is nothing to remove, but you should bathe the area in diluted lemon juice or vinegar. If you’re unsure what has stung your dog, apply ice to the area to reduce any swelling and irritation. In all cases, keep your eye on the affected area for a few days and contact your Vet if at all concerned. Some dogs may have an extreme allergic reaction to a sting; you should immediately seek Veterinary help if your dog displays any difficulties breathing. Wagg-On has taken precautions to reduce the likelihood of your dog being stung whilst being groomed. We have fly screens across all windows. A day in the life……spring has definitely sprung and Wagg-On Dog Grooming is busier than ever! We get lots of calls on a daily basis which is fantastic and we are delighted that our service is so popular. When you call, you are likely to be connected to our voicemail service and that’s because we never answer calls while we are grooming dogs. To do so would break the concentration of both groomer and dog which could cause a health and safety issue. We also don’t want to prolong the time a pooch is on the table by answering calls during the groom. Because we like to spend time getting a good understanding of our clients’ requirements and their dogs’ needs, each call back can take 5 or 10 minutes. When we are not grooming, we are driving to our next appointment. And when we arrive home at night, we have cleaning and admin duties to perform too……and that’s all before we have our tea! We will always get back to you within 24 hours of you contacting us - whether you get in touch by phone, text or Facebook message. You can help us be as efficient in doing so by leaving your contact details, as well as the breed of dog you would like groomed and the area in which you live. Look forward to hearing from you! Christine recently attended a Low Stress Handling and Restraint course (for our canine friends, not for Christine!) which provided lots of really useful tips for helping nervous dogs become more accepting of the grooming process. It’s amazing how comforting a wee towel around their necks can be – it makes them feel more secure. And of course, because we work one to one with each dog in our care, they have our undivided attention for the duration of their groom. Easter eggs and chocolate novelties abound at this time of year, but please remember that to your furry friend, chocolate can be highly toxic. Have a Happy Easter! Does your dog have a double coat? This means that there is a layer of soft, fluffy fur closest to his skin – known as the undercoat - and longer guard hairs which form top coat. Regular brushing is essential to ensure that the soft, fluffy undercoat is removed which will help to ensure that your dog remains comfortable and matt free. Double coated breeds will be insulated in the winter and kept cool in the summer. For that reason, a double coat should NOT be shaved – not even in the hot weather. Nature has provided the perfect coat for those dogs to ensure they stay cool in the summer. Shaving that protection off will not only reduce the cooling properties, it will leave your pooch prone to the harmful rays of the sun! Remember, our 4 legged friends do not cool down through their skin – they cool down through their paw pads and through panting. So, to keep your pooch cool in the summer heat, just make sure that he is brushed thoroughly and regularly to ensure that the air can circulate through his coat and do what it was designed to do. Now, bring on that summer sunshine…. Doggy Language! Attended a fantastic workshop today on Canine Body Language. Our dogs communicate with us in so many ways which can be missed in the blink of an eye. Fascinating subject and one which I look forward to learning more about. Spent a wonderful day at Crufts today! I had the privilege of observing various demonstrations by Police dogs, Hearing Dogs for the Deaf, Agility and some fantastic obedience work. Our Canine Friends are more than just a waggy tail! The dogs in the demos I watched looked so happy to be doing their job……and the reward? A ball, a Frisbee, oh, and sometimes a treat! Manicure? Pedicure? Or should that be PAWdicure? It is really important to ensure the health of your dog’s feet. If your dog is walked on concrete, gravel, etc., then his nails will be ground down naturally. If, however, most of his exercise is on grass, then that’s a different story. He will need to have his nails trimmed regularly. You see, if the nails are left to grow and grow and grow, as they will do if they are neither ground down or cut, then they can lead to painful feet for your dog. For example, the nails can curl back and grow into the paw pad – can you imagine how painful that would be? Not to mention the risk of infection setting in if the pad is actually punctured. Long, untrimmed nails can also lead to distortion of the foot, making the dog very uncomfortable and in extreme cases, inhibiting your dog’s mobility. Additionally, if his nails are very long and your dog scratches, he can injure himself and leave himself wide open to infection if the skin is torn. Add long nails to matted coats and you have a disaster waiting to happen. The long nails can get trapped in the matt, the dog then pulls and the skin is torn. Nasty. Trimming your dog’s nails is something that you may or may not be comfortable with. If you are not comfortable trimming them yourself (and many owners are not), then we can help. Nail trimming is something that we always do if necessary as part of a groom – whether it be a full groom or a mini groom – because we have your dog’s best interests at heart. We also offer a drop in nail trimming service – simply bring your pooch to us and we will trim his nails for just £5.00. HELP! My dog is shedding hair all over the house. What can I do to stop this? It’s unlikely that you will be able to stop the shedding process, because it is natural. Your pet will shed his undercoat in warmer weather when he doesn’t need it and he will grow a thicker coat in the colder weather, when he does. However, environmental factors and diet can impact on the natural cycle and interfere with this process. It may seem that your pooch sheds all year round as a result! Central heating is a primary culprit. As it gets colder outside, your pet receives a signal to grow a thicker coat. Which he does. Then you switch the heating on, which provides another trigger…..this time saying that the thicker undercoat is not needed. So, he sheds it. Then he goes outside and it’s cold…..this triggers more undercoat growth, then he comes back into the warmth which sends another signal and…..you get the picture? Diet also plays a part. It is important that your pet is fed a diet which contains Omega 3 and Omega 6 which will ensure his skin is healthy. This will ensure that the hair follicles are as they should be and will help to prevent excess shedding. In addition to this, it is important to maintain a regular grooming routine, which will remove the dead hair before it ends up all over your home. I am often asked when young puppies should be introduced to the grooming process. The answer is as soon as they have had all their vaccinations. Breeds who will need regular grooming throughout their lives need to be introduced to the grooming environment as early as possible, and this should be done as soon as they have completed their course of jabs. Here at Wagg-On, we offer Puppy Inductions free of charge. The only thing we ask you to do is to bring your pup to us – and we will do the rest. Puppy Induction takes only a few sessions of roughly 10 minutes each. We will work with your puppy, gently introducing your pooch to the sights and sounds of grooming until s/he feels confident and comfortable in the Salon. For example, we will run the dryer over your pooch, switch on the clippers, etc. just so that s/he gets used to it. Once we have your pup’s confidence, we will be able to carry out a full groom. It is vital that this process is started early in your young pup’s life. Leaving it too late can inhibit the grooming process and ultimately have a negative impact on your pooch’s grooming experience. Check out this wee video for a look inside the Salon! 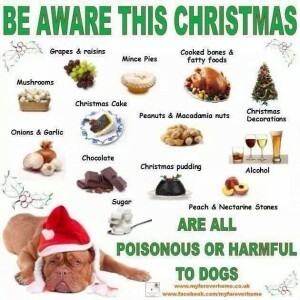 Nearly time for turkey and all the trimmings, but did you know that many of the foodie treats we will enjoy over the Festive Season are toxic to dogs? This article by the RSPCA highlights the ‘danger foods’ which we should avoid feeding to our pets: http://news.rspca.org.uk/2013/12/16/warning-as-a-quarter-of-owners-to-dish-up-christmas-dinner-for-pets/ Well worth a read! First day of advent today = lots of advent calendars, some with chocolate in them! Please remember that chocolate is toxic to dogs. 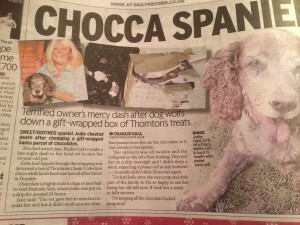 Make sure that your pooch cannot lay his paws on any Christmas chocolate treats not meant for him! Had the pleasure of grooming a Mum and her pup yesterday! Was so impressed with how she reassured the little puppy at her first ever groom…..and she gave me into trouble (barked at me) when I had to harness the little one for a moment for her safety (all to do with bottoms!!). Absolutely delightful wee dogs and look forward to seeing them again in January! Check out the new Faithful Friends Loyalty Scheme and Faithful Friends Referral Scheme in operation here at Wagg-On…..
Time to check your dog’s pads……salt and grit on the pavements can cause him extreme discomfort. A quick check to make sure that there is no grit in between his toes and no cuts or scrapes on his paw pad will help to ensure his comfort….and your clean carpets! Brrrr! It’s cold outside! Some people have asked me recently whether they should still have their dogs groomed in winter. The answer is yes, absolutely! Your dog’s coat/skin needs to be taken care of all year round to maintain optimum condition. You may find that your dog needs more washing/tidying at this time of year because he is perhaps more likely to get wet and muddy. A wet coat will matt more easily, causing discomfort for your pet and also providing the perfect environment for bugs and other nasties, like skin infections, to develop. A matted coat will not be able to dry out properly meaning that your dog will remain damp and cold. If your dog lives indoors and has a thick coat, he may be too warm because of central heating. This could cause him to overheat. Far better to keep him well groomed and pop a wee coat on before a walk – that way, it can be removed when he gets back home. Matted coats! Horribly painful for your dog and can host all sorts of nasties underneath. A matted coat is extremely uncomfortable for your pet because the hair almost knits together and gets tighter and tighter, pulling on his skin. When your dog inevitably tries to scratch, his claws attach to the matt and can actually result in tearing of the skin. Not to mention the bugs, dirt, faeces, infection, hotspots, sores, maggots, urine scalding which can develop in/underneath the matts………correctly brushing your dog on a regular basis will help to avoid all of this discomfort. Here is a link to a report on a most severely matted Old English Sheepdog called Floyd, who needed to have his coat removed surgically. It makes shocking reading! http://www.huffingtonpost.co.uk/2012/02/03/david-and-marjorie-massey-face-jail-over-neglect-of-sheepdog-floyd_n_1252416.html Now where’s that brush……. 10 October 2013 Removed a tick from a little dog today. These horrible parasites lie in wait for a prospective host – they can hide in tall grass or plants in wooded areas and can come from sheep or deer. If you walk your dog in areas like that, check him for ticks, keeping your eyes open for a couple of days afterwards. Ticks are minute when they latch on to your pet; you will only see them once they start feeding and grow in size. They can then look like large skin tags and at first you may not realise that it is a tick. Ticks can cause Lyme Disease and other nasties – so please be vigilant after a walk. You can buy tick removing tools from all good pet shops – keep one handy just in case. And always consult your Vet if you are at all concerned about your pet after you remove the tick. 8 October 2013 No dogs today – so been busy sewing. Doggy bandana anyone? 7 October 2013 Thank you to Scallywags of Glasgow Dog Training Club, Strathblane for providing the opportunity to meet some delightful puppies tonight. Remember, it is really important to introduce your puppy to the grooming process as soon as he has had his vaccinations. Wagg-On Dog Grooming offers free Puppy Inductions – just bring your pup to us and we will do the rest. Once your pup is accepting of the grooming process, we will then come to you and groom him outside your home.